Worth looking a little closer. On first glance Grazin' in Hudson doesn't stand out much. The diner's metal and neon front is tucked in along the streetscape toward one end of Warren Street. Inside there are vinyl-lined booths and a jukebox. The menu? Burgers and a few other things. If anything, Grazin' just seems kind of retro. But look closer and you'll notice what makes Grazin' stand out. That focused menu is truly farm to table -- as in, Grazin' gets its beef from its own farm. And Grazin's attention to how it sources its animal products has earned it the distinction of being the first Animal Welfare Approved restaurant in the country. "We opened the diner because we felt there weren't enough restaurants doing what we envisioned doing," said Andrew "Chip" Chiappinelli, co-owner of the almost two-year-old diner. "There had to be a market out there for people looking for the leanest possible fare." So while their menu may look un-extraordinary, it's what behind it that stands out. 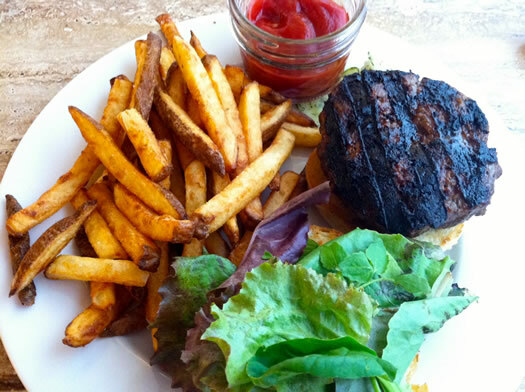 Their biggest menu item is their grass-fed Angus burgers from their own farm -- Grazin' Angus Acres in Ghent, owned by Chiappinelli's wife's parents. That's right, the burgers they serve come from less than 10 miles away. The rest of their produce comes from places like Roxbury Farm in Kinderhook, The Berry Farm in Chatham, and the Hawthorne Valley Farm in Ghent. 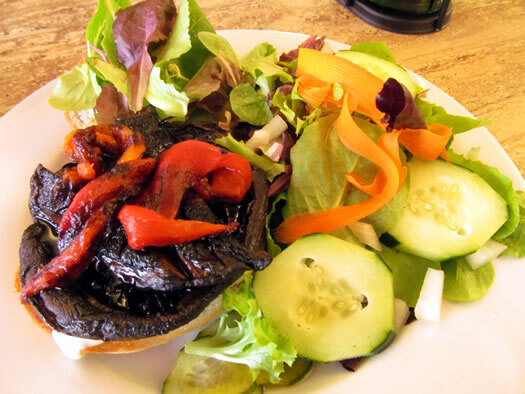 Even the condiments and toppings are fresh and organic - oil, vinegar, homemade organic sodas, and house-pickled vegetables accompany your main dishes. Their point of pride is the status as the first Animal Welfare Approved restaurant in the country. 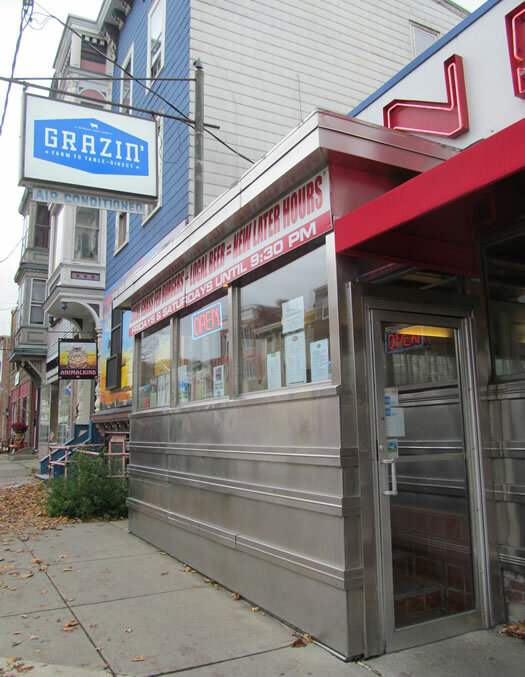 To achieve that distinction, Grazin' had to meet rigorous standards that ensure the animal products served at the diner comes from the most humane conditions possible. As the Animal Welfare Approved website explains: "the basic premise of all the standards is that animals must be able to behave naturally and be in a state of physical and psychological well-being." So why go to all this effort in sourcing ingredients? According to Chiappinelli: "There was no real discussion for us other than if we're going to go down this road we need to go all the way!Â The beef is raised purely on grass, which has been never treated with man-made fertilizers.Â They spend close to 3 years coming up to weight that way, so it's a labor of love, something we're very passionate about.Â If I took that beef and served it with a Coke I couldn't live with myself.Â I really believe that our customers appreciate the efforts we take." Their Suzie Burger has been a popular menu item since before the restaurant even opened. The "meatloaf-like" burger, as my waitress described it, was a favorite at the Grazin' Angus stand at greenmarkets in Brooklyn and Manhattan. Suzie comes with all of the toppings already mixed in. They add organic onions, ketchup, pepper and spices to the grass-fed beef. So when it arrives at your table, there's just the bun, the burger and some greens. The burger is fresh, nicely spiced, and surprisingly not dry without the additions of tomatoes, onions and condiments. It may not be as much fun as the Uncle Dude -- a burger with house-made chipotle mayo, local cheddar and Grazin' Acres' own bacon, jalapeno relish, greens, tomato and onion -- but for a girl who hasn't had a burger in quite a long time, this was simply delicious. 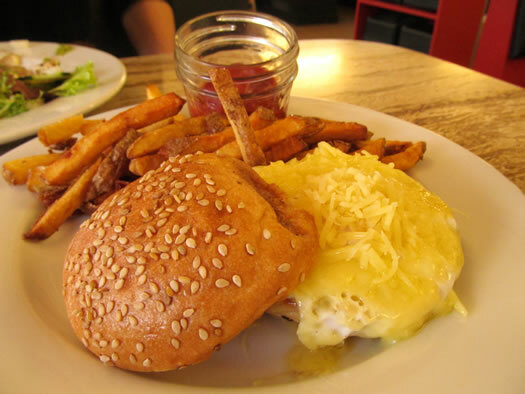 Grazin's egg sandwich is a little heavy on the cheddar and it comes with a side of fries, which is a little different, but it's tasty. And it comes with a backstory. The menu features a full paragraph on the origins of the egg and how the chickens live on the farm (including a mention of the portable "egg mobile"). I also tried "The Bello" burger ("for our vegetarian friends"). It's not made with the fresh, humane Angus beef that they're known for, but I love mushrooms, so that locally-grown portobello cap was a fine substitute. Although it was a little heavy on the buttermilk aioli, the rest of my veggies made up for it as well as the organic bun (also from a local bakery). Everything is local, the vegetables are house-pickled, the mayonnaise is house-made, they only offer something if it's in season, and they make eating a whole burger feel a little less guilty. In short, it's not the typical diner. I LOVE this place...and the homemade mayo is absolutely delish. It's been more than a year since I was there, but I remember the beer and wine list being quite decent too. The outside of that burger looks a little on the burnt side. How did you order it? This place looks really good. I am going to give it a try next time I am in Hudson. 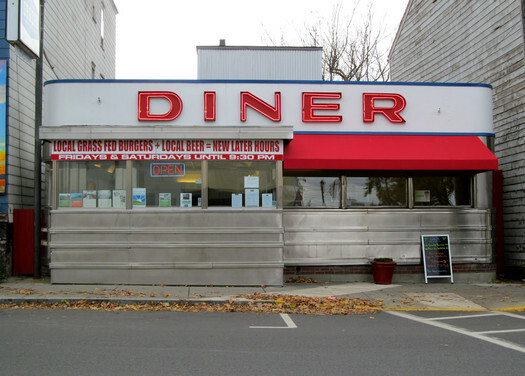 I used to eat at the diner all the time when it was still a diner and I lived in Claverack. I have to admit, after reading the sourcing standards that Grazin's beef is held to, I figured the prices would be astronomical. But they are totally reasonable! I have to give this a try the next time I'm in Hudson.